I’m so excited to announce that I’m credit card debt free! Woohoo! It’s been a long time coming. 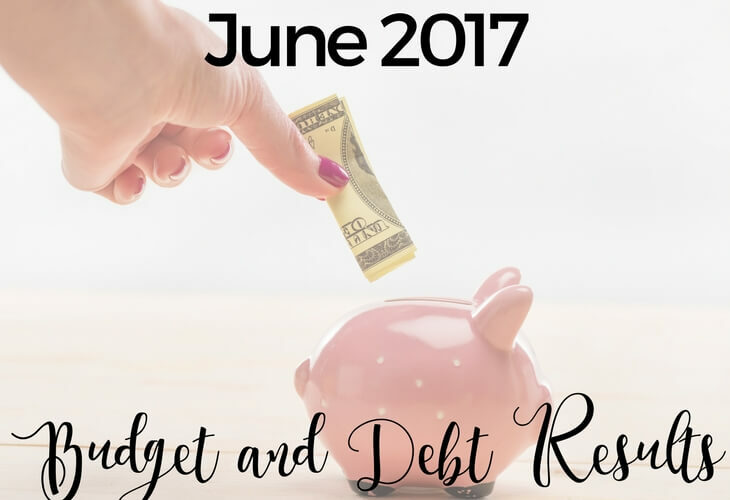 I’ve been blogging about and working on paying off debt since January 2014. I might have been credit card debt free sooner, but I’ve had some setbacks along the way. Some of them have been my own fault (like when I bought a car) and some of them have been curveballs thrown at me by life. But, either way, I’m finally able to say I’m credit card debt free! My next goal is to get my loan to my parents paid off. It my smallest remaining debt balance. Plus, I want to make sure they don’t feel like I’ve left them to very last. If I can keep up my current rate of debt payoff, I should have that knocked out in about 3-4 months. The debt snowball is rolling, which makes my debt payoff seem so much faster now that I only have a couple payments each month rather than having to make lots of little payments to many different creditors. Here’s a look my progress in June. Youch! It felt like an expensive month. In June, I ended up with some medical issues and had to go to the hospital a couple of times since they occurred on the weekend. Perks of living in a small town. The only medical care available after hours or on the weekend is the Emergency Room, even it’s not a true emergency… The only other choice is to wait until Monday and unfortunately while my problem wasn’t a big emergency, it also couldn’t wait until Monday. Since I have crappy insurance, I didn’t put as much into my savings as usual in anticipation of my up-coming hospital bill. I also had to get some out patient prescriptions that were kind of expensive. Those are included in my “cash/other spending” line. Because I keep having setbacks, I may have to push back my surgery by a couple of months. We’ll see. I also renovated my laundry room and had to buy a few supplies and things for that. I bought most of the expensive things a few months ago, but had to get a few smaller items to help finish the job. While I was out of town and in the “big city”, I took advantage of that and got a few presents for my family for Christmas (Yes, already!) and a couple things I needed for myself. We don’t have shopping in my small town, so when you go out of town, it’s time to stock up! June also meant I had to pay my quarterly taxes. This isn’t reflected above since it’s business expense, not a personal one, but it still contributes to my feeling of June being super expensive. Congrats on being credit card debt free! That’s a huge milestone! Sorry to hear that you were sick and had to go to the hospital. No bueno! Congrats on your TV appearance though! Thank you! Had a lot of fun and learned a few things on my trip! Yay for being credit card debt free! So exciting! So, what’s left – the parent loan and the car loan? Yes, plus a little bit of student loan. Can’t wait to get these loans knocked out! Doctor and dentist bills have been a major issue for us this year as well. Hopefully next year will be better. I hope so too. Those things really eat away at income! Loved the clip – you rock and looked beautiful!